EOS - European Organisation of the Sawmill Industry | News - 21 March the International Day of Forests! 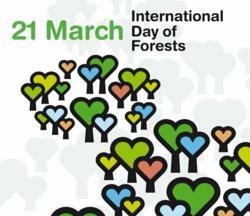 21 March the International Day of Forests! For this occasion the UNECE and FAO are organising the celebration of the International Day of Forests on 21 March 2016 at the Palais des Nations in Geneva. This year’s International Day of Forests is dedicated to the theme of “Forests and Water” as decided by United Nations Forum on Forests and the Collaborative Partnership on Forests. The celebration will consist of a half-day event aimed to raise awareness on the multiple links between forests and water sources. It will feature country experiences and case studies emphasizing forest ecosystem services safeguarding water balance and supply as well as forests’ role in increasing landscape resilience to water-related hazards.